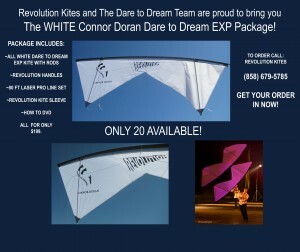 Revolution Connor Doran Dare to Dream EXP White Kite Package UPDATE! We just got news that there are ONLY 5 Kites Available! NOW IS THE TIME TO GET YOURS! They will be gone quickly so get yours now. Call (858) 679-5786 – ORDER YOURS NOW!